Robin Hood. Some call him the greatest thief and bandit and thug of the age. Others refer to him as a savior, a helper of the poor and defiler of the rich. Along with his band of Merry Men, Robin has always tried to do what's right by stealing from the rich and giving to the poor. The stakes have become higher now though and will he still be able to continue with his ways even with the sheriff of Nottingham after him? Largely re-moulded from the Star Wars Ewok Battle Wagon, but in different colours. Never featured in the film. The Bola Bomber is a special weapon used by Robin Hood in his battles with the Sheriff of Nottingham's soldiers. By launching these two huge bola rock bombs, you can ensnare the fiercest enemy! 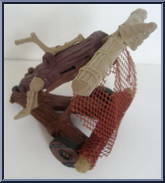 When Robin Hood must battle many foes at once, he uses his amazing Net Launcher! This special weapon fires a huge arrow attached to a large net to cover and trap several enemies at one time! Since their escape together from the deadly torture dungeons, the mysterious Azeem has been the closest ally of Robin Hood. His quick mind and deadly skill with the scimitar blade make Azeem a force t. . .
Chief henchman to the Sheriff of Nottingham, The Dark Warrior is a fierce villain who challenges Robin Hood! Clad in armor and equipped with a huge scythe, The Dark Warrior is not an enemy to be taken. . .
Friar Tuck is a good-natured ally of Robin Hood, but don't be fooled by his unthreatening appearance! He has more than one trick up his sleeve and his walking staff can actually be used as a fearsome . . . Pity the villain who crosses this guy! Little John is the leader of the woodsmen of Sherwood Forest and he possesses the strength of a giant! Many sorry villains have fallen to the swinging quartersta. . . In the hands of Robin Hood, the crossbow is a deadly weapon! By hiding it under his cloak, Robin Hood can sneak past enemy soldiers. When it's time for action, he pulls back his cloak and watches the . . .
No one is more skilled with a bow and arrow than Robin Hood! He can slice through a rope from across a courtyard or split one arrow with another! Robin Hood uses his great skills in his battles with t. . . In all of England, there is no one more evil than the Sheriff of Nottingham! His goal is nothing less than the utter destruction of his arch foe, Robin Hood, and he will let nothing stand in his way! Will Scarlett is the long lost brother of Robin Hood and shares some of his great skill with the crossbows. Although he can be hot tempered and brash, in the end, there's no one more dependable than W. . .